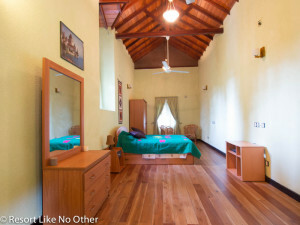 The family room has 2 queen beds and a junior bed allowing for a family to stay in one room. The bathroom is attached and has a shower, toilet and washbin with hot and cold running water. Your room can be cooled with the air conditioning or ceiling fans. making the atmosphere nice. The room is high as all original Sri Lanka houses.